The Zero7 Chorus Road Bike comes with artisan Italian style. With a revised 60TON carbon frame with SEI film, a complete Campagnolo Chorus drivetrain, Campagnolo Khamsin wheelset, alongside FSA and Selle Italia finishing kit, the Zero7 is a masterpiece. Zero7 is Wilie'rs super-light carbon race frame that weighs just 799 grams. Sporting integrated cables and an integrated fork for supreme aerodynamic efficiency, the evolution of the Zero7 Road Bike will help you climb onto the podium. 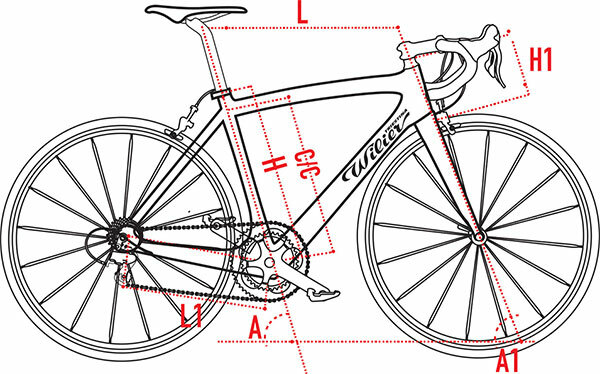 Updated construction techniques allow Wilier to produce a superb new frame design that reduces the volume of the frame tubes by 19%. A unique thermoplastic material is included to help to create uniform and equal pressure along the inner carbon walls of the Zero7 frame. This helps to create a stiff structure that's ready for raw power. They would take a really narrow clip on mudguard set but I'm afraid we don't stock suitable mudguards for this bike.